For medical facilities, HVAC control goes far beyond the ability to remotely adjust the thermostat. It’s about automatically ensuring each room has proper air quality, ventilation, filtration, humidity, and more. These systems can monitor a variety of air-related metrics and then automatically make adjustments to ensure that each area of the facility has the ideal environment at all times. Your HVAC control can also integrate into a larger energy management system that keeps cooling and heating costs low. Maintaining strong security requires more than just a CCTV system and door locks. Smart security can include intelligent video monitoring capable of identifying security issues immediately. A smart access control system makes it easy to restrict access to certain areas through badges, codes, or biometrics. The entire system is designed to make it easy for the administration to adjust permissions, authorize new users, or revoke access. Through door, window, and motion sensors, every area of your medical facility is monitored and secured. SEE ALSO: Smart Security Systems: Is Your Business Protected? First, it’s a way to ensure energy usage is optimized. Sensors ensure that you never waste energy lighting unused areas or areas already well-lit from sunlight through the windows. The energy management system can monitor and identify ways to improve energy usage by lowering brightness levels in certain areas or taking advantage of natural light. Second, it’s useful in ensuring each area has the ideal lighting for each use. In operational areas, you’ll want bright lights that make it easy to see everything in clear detail. However, in waiting areas or post-op rooms, it’s better to have a more relaxed, slightly dim lighting environment. With a central lighting control system, it’s easy to set the lighting levels across the entire facility. The audio/video installation in your building should be easy to manage, which can be a challenge when there are multiple video displays and sound systems in every room. Every display can be controlled by one central system, making it easy to change stations, lower volume, turn the display on, etc. The streamlined approach makes it easy to pull up medical records on the screen or turn the station to the patient’s favorite show. An audio/video setup can really enhance the look and feel of your medical practice. Soothe waiting patients with calming music or play educational materials on the high definition television. Provide entertainment in patient recovery areas to alleviate boredom. Whatever vibe you’re looking for, the right AV can make it happen. A successful building automation system needs a solid foundation to work effectively, and that means ensuring the building has a proper cabling and networking setup. 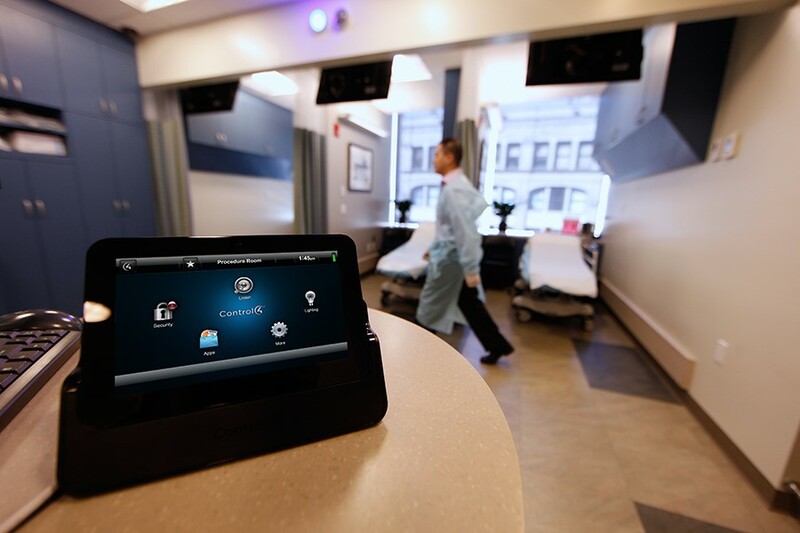 From building-wide Wi-Fi to the intercom system for paging doctors or calling for patients, we can design and implement a solution that meets your facility’s needs for performance and security. Whether you’re constructing a new facility or seeking a retrofit for an existing building, we’re ready to go to work for you. Components works with medical facilities of various sizes and types throughout Arizona. If you’re interested in learning more about how commercial automation can streamline operations and improve patient experience at your medical organization, give us a call today at 480.361.9500 or fill out this quick form!